The grey kangaroo is one of the most populous of all kangaroos (with numbers in the millions) and it is also the fastest of all kangaroos, reaching speeds of up to 70kph. This is the species of Kangaroo that you are most likely to see if you visit Australia, even though it tends to avoid humans. There are 2 types of grey kangaroo: eastern and western. The Eastern grey kangaroo lives in small groups but may congregate in large numbers when feeding. It is usually active from late afternoon until early morning, resting in the shade of trees and shrubs during the day. Strong, muscular legs propel the animal across the grasslands at speeds of 60kph. They are able to clear lengths of 8 metres and heights of 3 metres. Eastern grey kangaroos generally give birth to one infant at a time but twins have been reported. The Western grey kangaroo looks much like the Eastern grey kangaroo, and for many years was treated as a subspecies. They vary in colour, being anywhere from greyish-brown to chocolate brown. The muzzle is covered in fine hair. Western grey kangaroos are also very vocal. 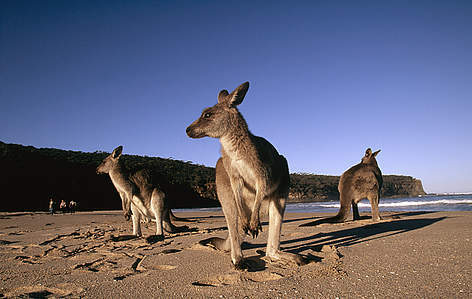 The mothers communicate to their joeys with a series of clicks. These are the main drivers of decline affecting many other mammals in Australia as well, and have resulted in this continent having the worst rate of mammal extinctions worldwide. Adopt a kangaroo! Help protect grey kangaroos through WWF US. Grey kangaroos are not endangered – but certain tree-kangaroos are! Find out more about tree kangaroos. 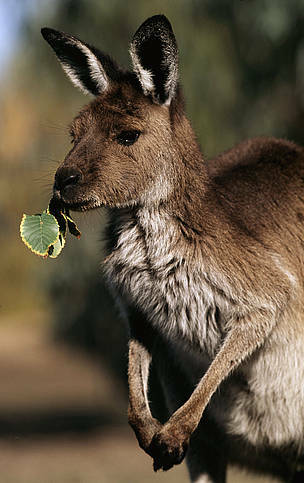 The Western grey kangaroo males are known as stinkers due to their strong, curry-like smell.